Alzheimer’s and dementia affect one in three Americans towards the end of their lives. While the prospect of facing one of these diseases is frightening, it’s a reality for many – and your chances of dealing with Alzheimer’s or dementia are increased if you are overweight. Fortunately, a new study from the Salk Institute for Biological Studies shows that a natural diet can go miles in preventing Alzheimer’s and dementia, thanks to a flavonol found in fresh fruits such as strawberries. The flavonol, fisetin, is a compound that has been proven to significantly reduce the risk of Alzheimer’s in mice. Study leader Pamela Maher, a senior staff scientist at the Salk Institute, called the study “groundbreaking”. The study examined the cognitive function of mice who were genetically predisposed to Alzheimer’s, comparing that of mice who were given a fisetin-enriched diet and mice who were not. Between nine and twelve months of age, the mice who were not on the fisetin-enriched diet were shown to struggle with basic memory function – while the fisetin mice continued performing just as well as mice who were not predisposed to Alzheimer’s at all. “Even as the disease would have been progressing, the fisetin was able to continue preventing symptoms,” Maher said. Coconut oil has also been shown to be great for preventing brain deterioration – some call it a “miracle cure” – but the connection between fisetin and memory retention may prove even stronger than this. Fisetin also shows potential for having anti-cancer and anti-diabetes benefits, having been studied for these effects before. Even the Alzheimer’s Drug Discovery Foundation says that it is indeed possible that fisetin can prevent dementia in humans – although they would like to see more evidence. There have not yet been any clinical trials done on humans to assess whether the compound will have the same effect in human brains as it does in mice – but the evidence so far is promising. 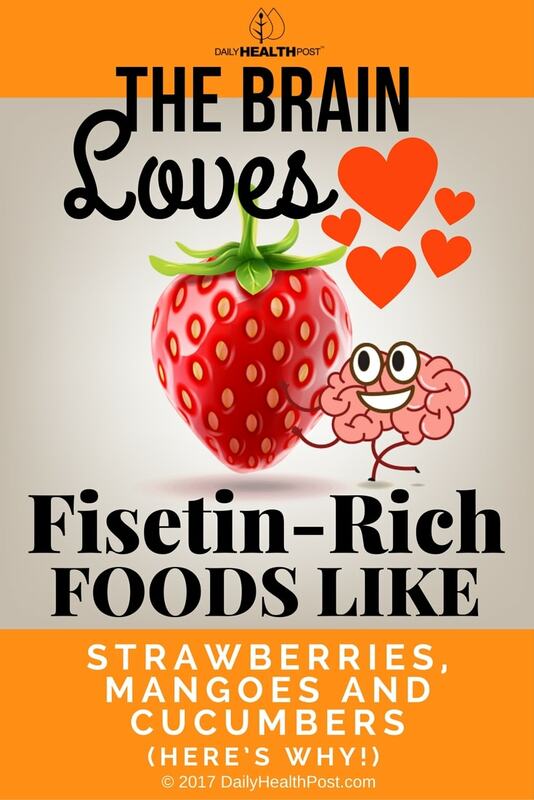 The best dietary source for fisetin is strawberries, but you’ll need to eat a lot to get a therapeutic dose – up the 37 strawberries at a time. The next best sources of fisetin are mangoes and cucumber with the skin left on; it can also be obtained from apples, persimmons, kiwi, peaches, grapes, tomatoes, and onions. Researchers are currently exploring the creation of fisetin supplements for those who want to be sure to get enough fisetin in their diets.